Epiophlebia superstes is belonging to Epiophlebiidae of Anisozygoptera. 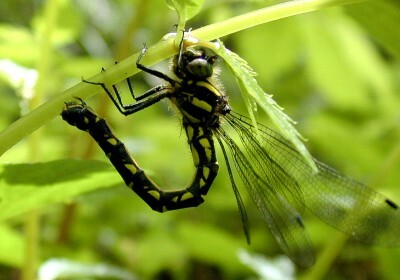 One species of dragonfly that belongs to Anisozygoptera is distributing in Japan. 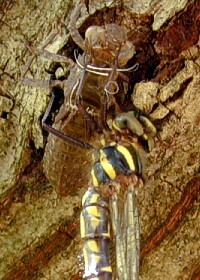 The dragonfly that belongs to Anisozygoptera is distributing 2 species in the world. Epiophlebia superstes is distributing it in the headwaters in a forest widely. The flight period in Kinki area is June from May. Larva　The larva of Epiophlebia superstes is discovered with face under the stone of a fast flow. When When we touch them they make sound. Embryonic development The egg period of Epiophlebia superstes is about one month. An egg period changes by water temperature. At average temperature 27.1℃ the average egg period was 18th. Hatching 1:Before hatching 2,3:Prolarva that goes out from the egg 4:Prolarva Time when it needs to 2 to 4 was about 30 seconds. 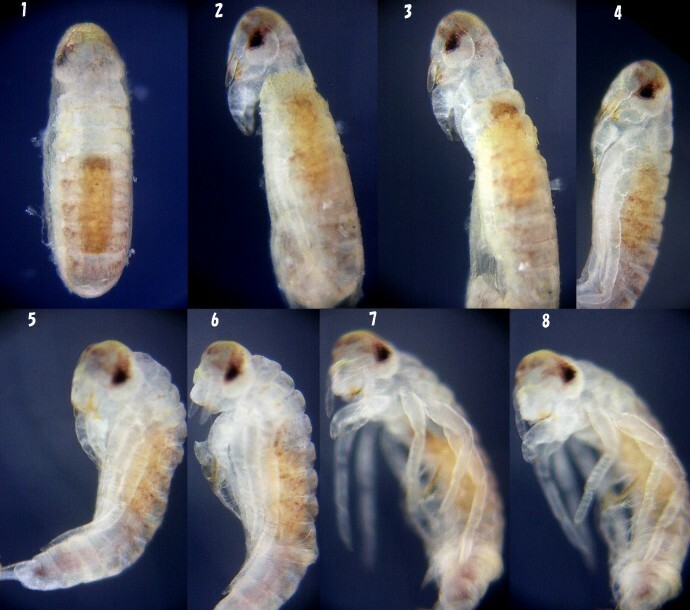 5,6,7,8: First instar larva that goes out from the prolarva The time when it needs in 5〜7 was about 90 seconds. The prolarva of Epiophlebia superstes jumps from the stalk of a plant and reach on the water. After that, the time when it needs is 30 minutes from several minutes to become a first instar larva. Prolarva/first instar larva Epiophlebia superstes lays eggs to the plant that is in a higher position than the surface of the water. The prolarva that hatched repeats a jump and arrive on the water. Until it reaches on the water it does not become a first instar larva. The time of the prolarva is a dozens minute from several minutes. 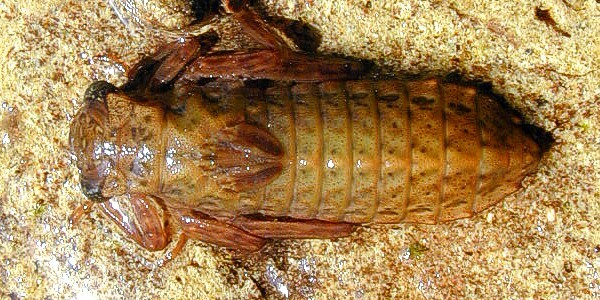 The period of the prolarva is longer than other dragonflies. 1:Prolarva that goes out from a plant (Elatostema umbellatum) 2:Prolarva The tail edge of the prolarva of Epiophlebia superstes is sharp. 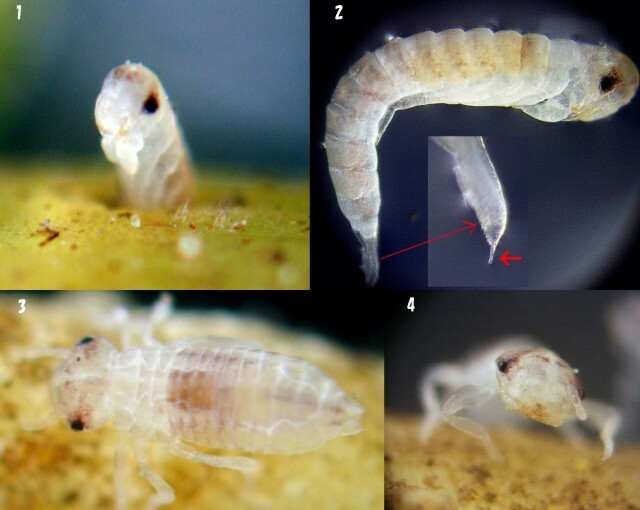 3,4: First instar larva Size: body length 1.24mm, head wide 0.40mm, antenna length 0.21mm. Micropyle　The micropyle of Epiophlebia superstes is lining up to a circle in the place where parted a little bit from an anterior pole. The micropyle number of Epiophlebia superstes is more compared with other dragonflies. It is difficult to be seen the micropyle of Epiophlebia superstes. It becomes easy to seen micropyle of Epiophlebia superstes to middle period of embryo development. 1:　Place which has a micropyle 2: A micropyle has been shown with an arrow. 3: We can see a micropyle when we see it from right above of an anterior pole, if we are the first term of embryo development. 4: We can see 11 micropyles in the figure. The micropyle number of Epiophlebia superstes differs by an individual and are 10〜15 pieces. The micropyle number of the average of Epiophlebia superstes was 12.7 pieces. Egg-parasitoids wasp The egg-parasitoids wasp of Mymaridae is parasitic on Epiophlebia superstes.